The demands on musicians to have appropriate instruments for a wide range or repertoire, given the cost of stringed instruments, have led to an understandable degree of compromise. Instruments were (and still are) often commissioned and set up to “work” for a wide range of repertoires – unfortunately one could argue that they then truly work for none! The extension of the period instrument movement into the late 18th and 19th centuries has also tempted many modern players to become involved: this has brought about another kind of compromise, in which instruments have been set up to be easier for modern players to pick up and learn quickly. There now exist, therefore, a large number of “baroque” instruments which incorporate many features of classical and modern violins. While this has made it easier for large numbers of musicians to acquire the facility to take part in historical performances and recordings, there have been inevitable losses. The clear delineation of different national and period styles has become blurred, and the essential process of learning from the precise qualities of an instrument belonging to a particular time and place has been diluted. It was mentioned above that it is easier to play Monteverdi with a “Mozart” violin, but what do we miss when we do this? The rich, nutty, complex sound of very thick gut strings; the consort blend within the violin family; the wide range of articulation , and countless unnamable subtleties of expression peculiar to the Venetian 17th century sound-world. These all depend on – or at least are facilitated by – having the right instrument for the period in all its details. This excess of compromise, understandable though it may be, seems in conflict with the true spirit of period performance. This spirit has at its core the principle that we can learn most about the sound-world of a particular era by using and trusting the information from that era; this can apply to just about everything, from instrument design to philosophy of performance. 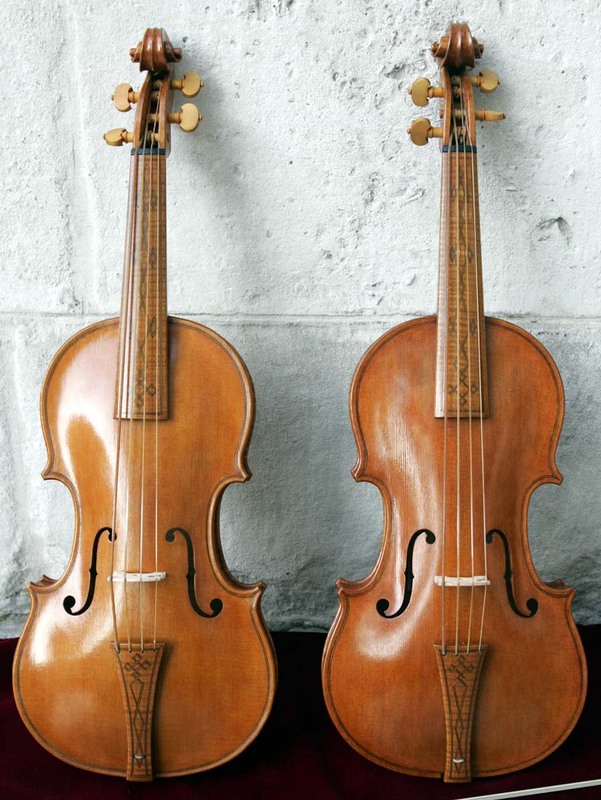 It seems particularly pertinent to violin making, where a great deal of information is available about historical practices, and we must surely believe that great makers such as the Amatis, Guarneris and Stradivaris made instruments which were best suited for playing the music then current. In our own experience, following this path has always given more rewarding musical results, and this should be the ultimate test. We believe that one plausible approach is to attempt to recreate instruments from a very specific time and place. In our case we were fortunate to have a precise brief: violins such as would have been used by Monteverdi in Mantua or Venice around 1610. Similar projects are limited only by the imagination: for Purcell, London in 1680, for Corelli, Rome in 1690, for Couperin, Paris in 1710. In this way we can avoid trying to promise too much - we would not be aiming to create an instrument that could be used for everything a player might be asked to do! - and in doing so achieve the best possible results within the remit. No Jack of all trades, then, but a true Master of one. This is of course an “ideal world” philosophy. As we are all painfully aware, musicians, even at the highest level, rarely have the spare cash to commission several instruments. However, the Gabrieli Consort and Players have always been enthusiastic about this approach, and we were delighted that the Gabrieli Trust was able to support us in this latest venture: it has truly been a luxury to have the opportunity to make these violins. We hope that they might become the seed of a new movement, and that as more “dedicated” instruments are in the public eye (and ear) we can develop a greater and more refined understanding of the sounds great composers of the past had in their minds. We hope to find more opportunities of this type, to develop, refine and learn from the work we have done. If you have found this intriguing, share our philosophy, and feel you may be in a position to support future projects , we would of course be delighted to hear from you. The range of articulation is especially interesting, because it allows the player more closely to imitate the pronunciation of text, with different types of consonant beginning each syllable (or bow stroke). The imitation of the voice has always been one of the most important goals for instrumentalists, and it is therefore very interesting to think about how singing styles have changed through history. Oliver Webber’s ensemble, The Monteverdi String Band, is currently planning to commission a full violin band from George Stoppani, building on the research done for the Monteverdi violins. This is a major project which will require a great deal of research; we plan to publish the findings in the Galpin Society Journal in due course.